I just want to thank you so much for making such a perfect lightweight E-Mail client. I love it, and I'll be using it a lot! Works flawlessly. This is possibly one of the best working lightweight and extremely fast email clients out there! It there a way to make nPOPuk delete the messages from server after retrieval ? very light weight and resource friendly. it's missing a number of features found in Pop Peeper and PopTray, but it's a pretty well-rounded client for portable applications. it did generate a few memory allocation errors when enabling SSL however. A very good little package with lots of potential for becoming a serious threat to OE. With a few little tweaks and add-ons, the author(s) could make this not just good but excellent. what would be great is if there was a keyboard friendly way to sort messages when viewing a mailbox. whilst almost every function is npop can be accomplished via the keyboard, this is one that cannot be accomplished if you find yourself in a situation without a mouse. a further function that would be useful is if the messages were numbered when viewing a mailbox, and one could jump to a message by typing the number, as you can in mutt. now that mailboxes are in mbox format of course you can just use mutt or pine to read them. the mbox feature is great! The only drawback of this little gem is that... it doesn't work in Linux environment. And I didn't find anything that would get even close to nPop in the means of functionality, readibility and simplicity. 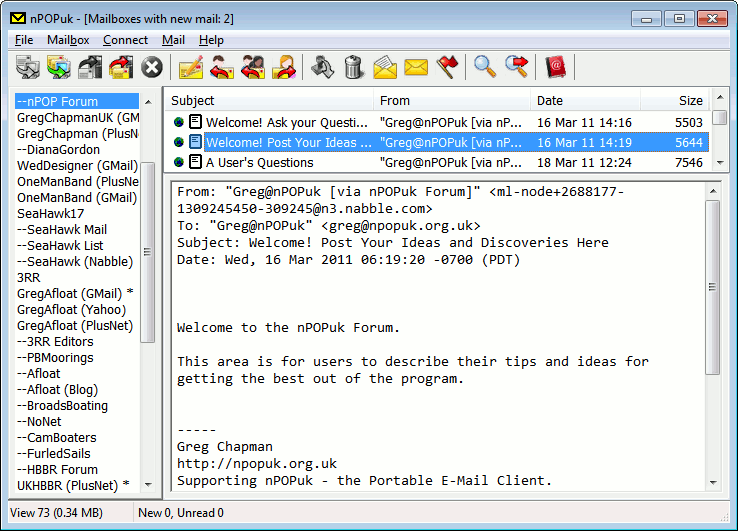 An great e-mail client in a very small package. Eminently portable to flash memory, program and mail files. Address lists, send/receive attachments, thread view, can download message headers only for preview, can delete spam on server without downloading, .... Very secure -- plain text only; does not render rich text or html. A drawback -- does not have a print engine; workaround is to configure export to your standard text editor. To print a message: a button click to export to text editor, print message, and a button click to exit editor and return to nPOPuk.